Gardens from China are always considered to be expressions of the noble arts, in their aesthetics being reunited philosophical and religious ideas. These gardens have been realized around monasteries and hermitages, representing places for contemplation and collectedness. The urban gardens reminds to the Europeans many baroque elements: the prevalence of the curved lines and the contrasting organization of the nature elements: water – earth, valley – hill. The Chinese gardens represents a succession of scenes that reveals different impressions, therefore the visitor always is surprised and amazed. Although they are creating different sentiments, the scenes are realized with the help of the elements found in China's nature: mountains, plains, wastes, rivers, lakes, islands, mountain or plain vegetation. The art consists in the joining of these elements so that a calmness atmosphere to be created. The Taoist philosophy centred upon the living of nature has generated the water and mountain cult in the Chinese garden. The water and the stones are the bearers of great symbolic values and consequently are the pillars of the Chinese garden aesthetic. The mountain represents the specific element both in painting and Chinese garden. To Chinese nation the mountain symbolizes the earth element (Yang – vertical) and also the idea of immortality place. Many time the Chinese artists replaces the presence of a genuine mountain with a rocks pile, this thing representing the continuity of an ancient cultural tradition. The rocks represent the structure framework of the Earth and the water (Yin – horizontal), by its movement, symbolizes the living pulse of the Earth. The mountain and the rock are associated to the expressionist vision of nature, bringing an philosophical aspect to the garden ensemble and the water is more lyrical, suggesting a impressionist vision. As for the garden vegetation, very appreciated are the flowered shrubs and trees and also the floral masses coloured in varied nuances. 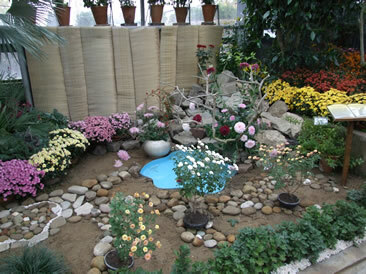 In this space we have intended to respect the MASTER desire to reflect two souls: the nature soul, represented by vegetal groups where you will find very delicate chrysanthemums varieties, rocks piles, and also the gardener soul. He is the creator who tried to realize an equilibrium closed to that existing in nature, represented by Tai chi or the unity between Yang and Yin. According to an ancient Chinese legend, about 3,000 years ago, an emperor was told that the Dragon-fly Island in the Sunrise Sea (Japan) had a magic herb that would restore his youth. But since only youth could collect it, he sent a dozen young men and a dozen girls to the island. They arrived at the island after surviving perilous storms and attacks by sea serpents and there, they have found a golden chrysanthemum.